Among the activities that molded their instincts and physical features were herding cattle and sheep, vermin terminators, hunting both in water and on land, and serving as watch dogs that deterred trespassers. 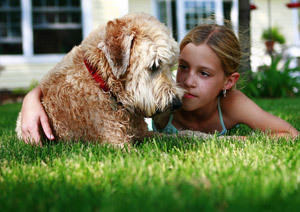 The soft coated breed of terriers, shortly called as Wheatens, originated from Ireland. The date of their existence was obscure but many assumed that their breeds were one of the oldest among other Irish varieties. They were molded as herders, farm dogs, and hunters and terminators of vermin, like the Cairns of Scotland. From Ireland, they were brought to the US in the year 1946. Slowly they gained popularity as pets and as entertainers. However, the extraordinary appeal of this breed to the Americans at present would not be possible if Patrick Blake did not save its lineage from extinction in1932. They were registered by the American Kennel Club in the year 1973. Though their types have hunter instincts, they can get along well with older children and other animals within the household through proper training and attention. Like most terriers, they easily develop close affinity with family members so they normally appoint themselves as watch or guard dogs. For professional breeders, why not appoint them as well as your pet especially when you are looking for a playful yet reliable companion and guard dog? To this effect, you can say that what you own is one heck of a dog—a dog that can work and play as well!